I was happy to co-sign it! 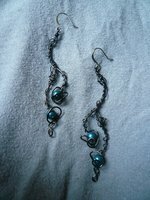 As a fantasy jewelry artist, I will, as early as this fall, be looking to sell my jewelry at at as many conventions as I can reasonably attend. But it’s immature and unacceptable for a convention to sell out victims to keep their customers happy. Also, as a 24-year-old woman, I’m not enthusiastic about trapping myself behind a table for a weekend unless the convention will assure me I’ll be reasonably safe from people bothering me. When I approach a convention about becoming a dealer, I will absolutely commit to having a jewelry showing on that weekend in that town. Promotional materials and press releases for this alternate event will highlight the convention’s poor approach to keeping guests safe. -Dragon Con: Bright shiny new anti-harassment policy this year! Do you go to conventions? Is the statement something you would co-sign? Why or why not? 1. You can enter even if you don’t have a DeviantART account. 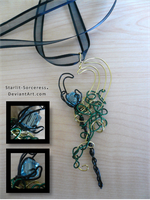 Work with another artist to make art from two different mediums, inspired by my jewelry. 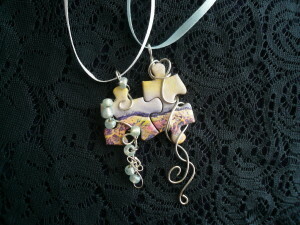 Both artists of the winning entry will win these puzzle piece friendship necklaces. 1. Both of you must be subscribers of my newsletter. At least one of you must be a new subscriber. 2. 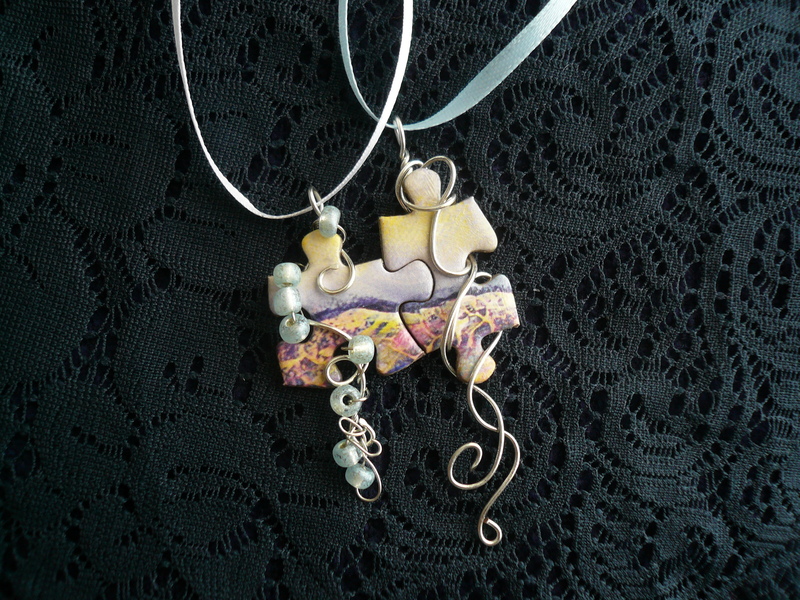 Work together to make a piece of art inspired by my jewelry style, each contributing a different art medium. 4. If possible, link to this page and any jewelry pieces you were inspired by. 5. Each of you, message me on that site with your contribution. Each entry must have at least one new subscriber. Someone can only count as “the new subscriber” for one entry. Someone can only contribute to three entries. 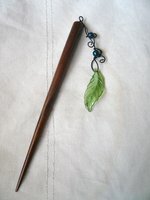 What kinds of art do you like to make? What kinds of art can you make your art out of? What artists can make their art out of your art? Feel free to add questions and comments. Eragon had it’s moments as a movie, but the book was so much richer and more detailed. The Wizard of Oz was one of my favorite books growing up. Especially with all the hype that’s surrounding the prequel, I encourage people to check out the original book. Did you know that the events in the movie only cover the first half of the book? Glinda doesn’t just show up after the wizard flies off in the balloon. Dorothy and her friends have to journey to her realm before she can reveal the secret of the ruby slippers. Hitchhiker’s Guide to the Galaxy was an awesome movie that tried to be just as awesome as the book, but failed. (Speaking of Hitchiker’s Guide movie, anybody recognize Arthur Dent? Speaking of Martin Freeman, I’m going to risk offending literature fans by admitting I’d rather watch an episode of BBC’s Sherlock than read one of the original Sherlock Holmes stories. V for Vendetta. No offense to Alan Moore, but the movie left out the slow parts and boiled the original graphic novel down to all the good stuff. Extra: There was a book? In most cases, if a movie is based on a book, I have at least a casual interest in reading the book first. Or soon after seeing the movie. Or someday! Because of this, I’ve noticed a lot of movies that were surprisingly based on books. “Day the Earth Stood Still” for example. Sure the 2008 movie was based on the 1951 movie…but the 1951 movie was based on a short story called Farewell to the Master. (I liked the 1951 movie the best out of all of them.) Other movies based (or inspired) by books: Meet the Robinsons, How to Train your Dragon, and does anybody else remember The Last Mimzy? Extra 2: There wasn’t a book? Not all movies were inspired by the book they’re marketed with. After years of being disgruntled with an I, Robot that didn’t seem to care much for the original collection of short stories by Isaac Asimov, I realized it started as an original screenplay called Hardwired, and not too many changes were made after they got the rights to call it I, Robot. And of course it languished in development until Hollywood found something popular to market it with. I guess it all turned out better than their original plan, which was to edit it beyond recognition with an action plot and space marines. So when was the book better, and when was the movie better? And when were they both equally good according to each unique art form? I was moved to write today’s post when this site helped me dramatically revitalize my artist statement a few hours ago. The link opens in a new tab, but I’m happy to describe the site if you’d rather stay here. The site is very minimalistic. The most prominent feature on the mostly blank page is a simple sentence. “I made tea.” But each word is highlighted in light gray. Clicking on highlighted words will expand them into more words, some of which may also be highlighted. “I made a cup of tea.” A few clicks later: “Yawning, I made myself a nice cup of strong tea.” When there are no more clickable words, the page will be covered in words. At the bottom right corner is a link to make your own telescopic text. Type a sentence. Click on a word. Type the text that it will expand to. Click on another word. When I first found Telescopic Text, I played with the tea story, bookmarked the site, and forgot about it…until I realized how much it could help me with my artist statement. I arrived with two things: My tagline and my old artist statement. 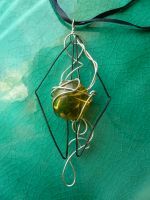 My tagline, “Fantasy-inspired art jewelry”, is pretty solid, but my artist statement was a scattered, disjointed collection of an otherwise decent way to describe my artistic vision and mission statement. and then I highlight it. I’m inspired by magic and high-fantasy. beauty and awe in everyday objects and scenes. The basic generator lets you pick typical options such as “short”, “long”, “vowel-heavy”, but the advanced generator not only shares how it generates such specific names, but invites you to customize your own. It’s a little confusing at first, but if you have the time to figure it out, it will quite possibly become your most useful name generator for getting the perfect name from very specific instructions. Let’s see… how about a name beginning with “Lo” that starts out soft, but ends on a harsh or abrupt syllable. -Uppercase C stands for a random consonant or combination. I discard “Lousit” because it sounds like “lose it” and refresh the page a few times to get hundreds more results. I like the last one. Also Loerok or Loedoc from the first round. Unlike a lot of blogs, they have a nice big list of their favorite/most useful posts on the left sidebar. I really want to go into more detail and list a few of their most awesome posts, but there’s so much good material there, I’d barely be scratching the surface. Did you explore any of the sites? Share your telescoped text, generated names, and writing breakthroughs in the comments. This is my third post in what has become a series about non-traditional ways of participating in fandoms. Do you have to read/watch all of a series to call yourself a fan? Very few people who like the Avengers have actually read all the comic books. Not many Doctor Who fans have seen all 26 seasons of the classic series. Do you know any Skyrim fans who have played Elder Scrolls #1? But fans get less of a break when the fandom has a smaller time investment. What about you? Did you start watching Star Wars with the prequel trilogy? Did you only play Mass Effect 3? Share your unconventional fandom experiences in the comments. Unconventional Fans 2: Fandoms don’t have expiration dates. It aired almost ten years ago. Yesterday I was watching a hilarious YouTube video that combined “Trouble with Tribbles” with Taylor Swift’s “I Knew You Were Trouble”. A commenter lamented the spoiler because they were in the middle of watching the original Star Trek for the first time and hadn’t gotten to that episode yet. Star Trek aired almost fifty years ago. I still haven’t read Game of Thrones or played Mass Effect, but I expect to adore both of them. And I’m sure that’s the case for a lot of people…more than we usually realize. Which fandoms have you arrived “late” to? Did you manage to enjoy the fandom and still finish the story relatively spoiler-free? My biggest frustration about discovering “ancient” fandoms is that I usually have very few people to share it with. Plenty of people will acknowledge that it’s awesome, but they’ve already experienced it and moved on years ago. After thinking about it for a while, I thought of all the shows/books/games/etc. I’m currently most interested in (Doctor Who, Sherlock, The Hobbit, Dragon Age) and then I realized that what they all have in common is that I haven’t experienced the end of the story yet. Stories I like just as much but have “finished” already (such as Firefly and Deep Space 9) just can’t seem to capture my imagination as vividly as they used to. Is this because “ongoing” stories are more fresh in my mind? Or is it because a corner of my mind is just desperate to know what happens? Am I not really affected by either, but since the rest of the online community is, I’m more drawn to active fandoms? What are your experiences watching/reading/playing the end of a favorite story? What happens when you become less interested in a favorite story? Do those questions answer each other? -Have you ever read (or watched) a story with various fantastic species, and suspended your disbelief for some more than others? -Have you ever been at odds with the various theories and workings of magic described? -Or maybe your ideal fantasy world is more like the real world than a fantasy world, except for a few shy, ancient beings who dabble in minor nature magic. In fantasy worlds, I like advanced technology just short of gunpowder. Magic is advanced, and has clear rules. Speaking of dragons, I can’t decide whether I prefer them to be friendly or evil. I guess I just don’t like the extremes. Not singing with children and puppies, but not brutal animals either. What elements make up your ideal fantasy world? So I’m a jewelry artist. Not a lot of blog topics that I don’t already talk about. -My inspiration? 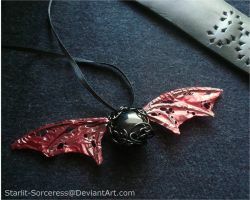 I share that when I post new jewelry to DeviantART. -Behind the scenes photos and stories? Those go on Facebook. -Unrelated snippets from real life? I’m on Twitter too. -Detailed tutorials on making jewelry and running a business? Not very interesting unless you’re another jewelry artist. So I decided to step out of the spotlight just a little bit. This blog is for discussions! It’s not Thursday yet, but why wait? I’ll leave this up as a permanant suggestion box. What topics do you want to see? Should I post at a different time than Thursday night?